Oh, Mr. Greist, where have you been my entire sewing life? Though branded to go with my vintage Viking 6020 machine, this is really just a Greist buttonhole attachment I found on e-Bay for $15 – best sewing money I have ever spent! It makes absolutely and perfectly consistent buttonholes with one of 13 cams. And you can adjust bead size and gap spread to your heart’s content – an amazing piece of antique sewing technology!!! 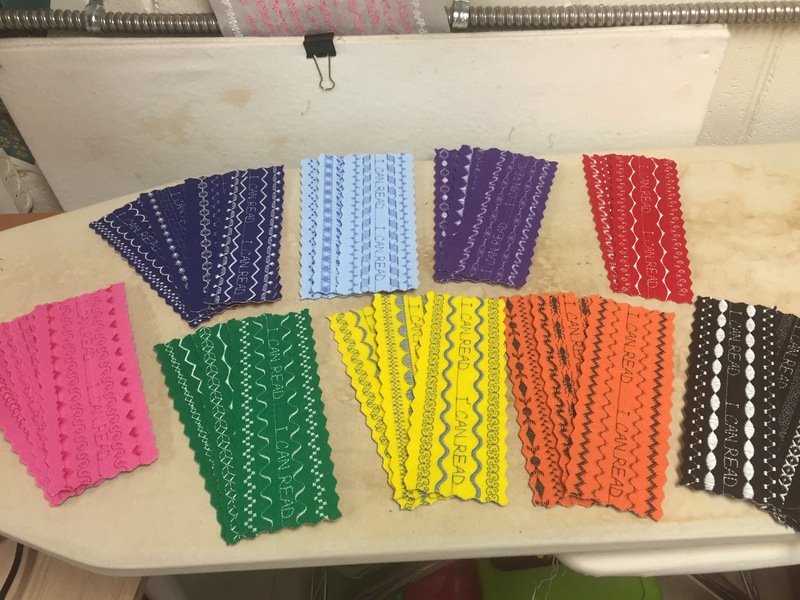 The machine embroidered bookmarks I made for Juliette’s kindergarten class. They are a surprise gift, made in each student’s favorite color, that I will give them as the year’s final Book Nook reader on Thursday. Time consuming, but so much fun to make, using lots of different decorative stitches on my Pfaff Performance 5.0 machine. They all say “I CAN READ” on them!